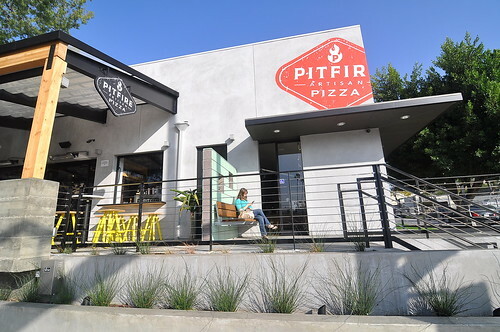 I’ve been a fan of Pitfire Artisan Pizza ever since sampling their slices a few years back, so I was pumped when Paul Hibler and team announced that their eighth location would be right in my own backyard. There certainly isn’t a shortage of pizza purveyors in Pasadena, but you know, a girl’s got to have choices. Housed in the abandoned Sizzler on Arroyo Parkway, the new Pitfire is airy and spacious with communal tables, high ceilings, and wide aisles (perfect for parents with strollers—like us!). An eye-poppingly red Mugnaini oven provided a fitting centerpiece to the room. The Astronomer and I came in for lunch with Baby June last week—our first solo food outing with the little one. Fortunately, she slept through the whole meal. Service here is of the fast-casual variety, with orders placed at the front counter and food delivered when it’s ready. 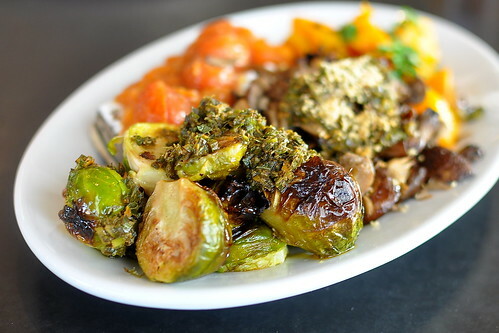 The first dish to arrive was the Fall Farmers Market Plate ($10.85), which included roasted mushrooms with herbed citrus bread crumbs, ginger tomato jam and ricotta on grilled rustic bread, roasted brussels sprouts with salsa verde, and chile roasted pumpkin with garlic oil. The Astronomer and I both agreed that the ginger-spiked tomato jam on toast was most definitely our jam. 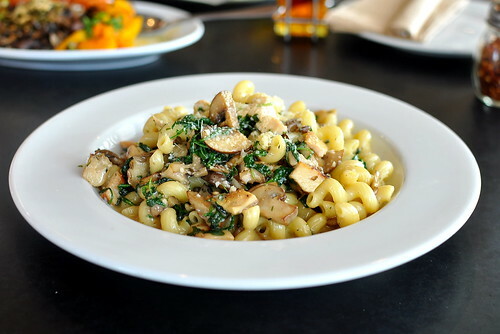 Before diving into the pizzas, we shared the Chicken & Mushroom Cavatappi ($11.35). The creamy, garlicky sauce coating the tubular corkscrews was deeply earthy and wholly delicious. The Astronomer was pleased as pie with his pie this afternoon. 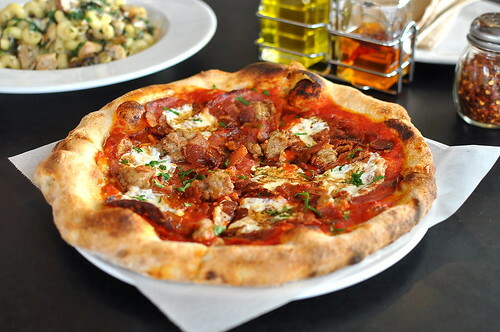 The Sausage Party ($12.15), a meat-lovers delight chock-full of fennel sausage, salumi, and bacon, was a savory powerhouse with plenty of protein in every bite. 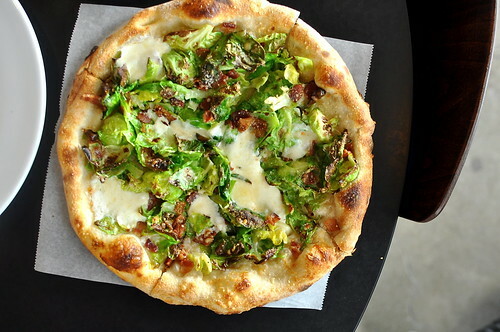 While not quite as meaty as The Astronomer’s selection, my Sprouts n’ Bacon pizza ($11.25) was just as satisfying. I loved how the leafy greens, crisped bacon, and red chile flakes perfectly punctuated the pizza’s decadent whipped cream and fresh mozzarella foundation. Pitfire’s puffy-edged crust was as solid as I remembered. 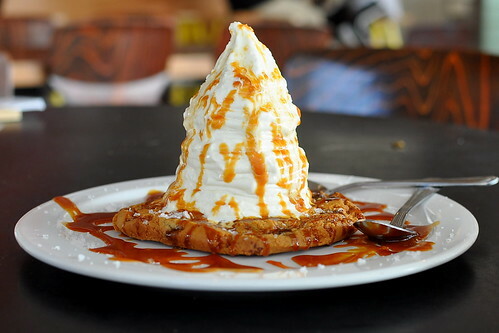 To finish, an order of the Pitfire Smothered Cookie ($5.35) featuring Straus Family Creamery vanilla soft serve atop a warm chocolate chunk cookie with a drizzle of house-made dark caramel sauce. Pro Tip: Request a flourish of Maldon salt for a sublime sweet and savory experience. Now, wouldn’t the world be a better place if every Sizzler were converted into a Pitfire? 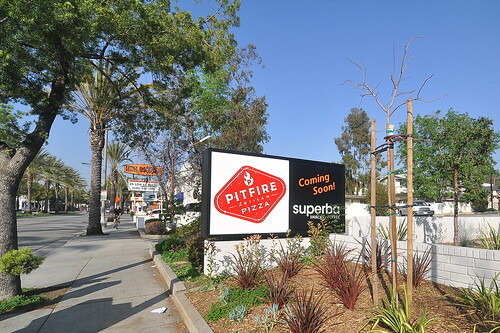 Coming up next for Paul Hibler and team is the debut of Superba Snacks & Coffee in February 2014 right next door to Pitfire. 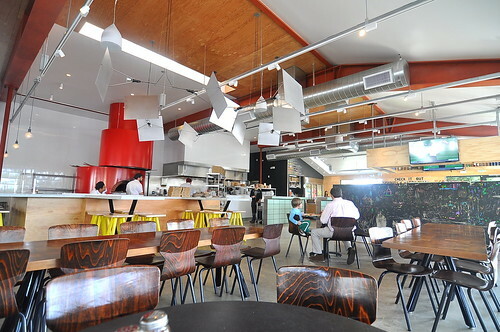 Fresh breads, pastries, and Verve coffee… I can’t wait. I ate at that Sizzler once many years ago – a surprise birthday party for a friend who claimed he “loved” Sizzler. It was not good. I always considered blogging about that meal as a joke, but it just didn’t seem all that funny. My parents actually ate at Pit Fire yesterday afternoon, and they really liked it.